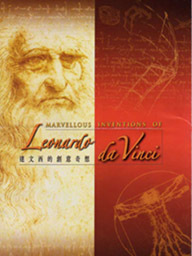 上星期往科學館看展覽, 相信大家對這個設計大師也不會太過陌生 - Leonardo da Vinci 達文西. 也許你是從電影Da Vinci Code (達文西密碼) 認識他,又或是從講述文藝復興時代的書籍認識他;甚至是旅遊期間在羅浮宮欣賞"Mona Lisa 蒙娜麗莎"的時候深深被他/她吸引着...總之,多少你也會聽過這個名字罷?! 今次展覽內容有驚喜也有失望. 驚喜是發覺達文西除了在繪畫, 雕塑及建築設計上, 竟然在軍事, 力學, 飛行學上也有不少有趣的想法和研究. 我不會一一說明, 留待你們自己觀賞, 也許你會發現當中有一些是你我兒時也曾妙想天開過的想法,只是從未認真對待, 何不妨在這一刻回味. 展品中不乏出名的畫作, 但我們認為更值得看的是其人體解剖筆記圖. 雖然看不懂他的"鏡字意大利文" 筆記, 但當配合着精準而線條優美的人體繪圖, 實在令人讚嘆. 如果我們現代人能夠有這般專注及毅力去造學問或處理事情, 世上很多難題也許可以解決. 不得不提 的是一套關於達文西心中理想城市的動畫短片,雖然動畫製作粗劣, 但當中的城市設計正是我們現今社會所謂的建築所缺乏, 或正在摧毀的環保建設 ,有時間不妨慢慢用心觀看, 你會發覺人類真的不需要住豪宅,更不應把商場代替廣場! 好了! 失望 : 是大部份展示品都是低至普通水準的複製品, 所以多少也影響其觀賞價值, 特別是當大家欣賞心愛的畫作時,要感受到顏色所帯出的豐富層次, 實在是有點大打折扣.再加上香港人那種何時何地也實踐的"親子教育" 及"到此一遊" 的拍友, 我想, 此刻正是運用"專注" 的好時機了. I am so happy I am not alone. I went to see his exhibition early this year at Vancouver Art Gallery for the same reason. His drawings about human really amazed me. I was thinking, if we can learn from his dedication in details, in finding knowledge, nothing is really impossible in this world. it's for sure you are not alone,i believe there are lot more people have the same thought around the world; thanks for sharing the link with us. sy, welcome aboard. there are too many interesting design, the diving helmet is one of that for sure. But the sketches of human organ are perfect.